I’ve been meaning to share this post for a little while. As some of you may know, I had a little European adventure last year, during which I visited the famed ‘fairy-tale castle’ in Germany – Neuschwanstein. It was built in the nineteenth century by King Ludwig (also referred to as ‘the fairy-tale king’ – pretty awesome name). This castle apparently inspired the one in Walt Disney’s 1959 film Sleeping Beauty. Here’s a photo I took of Neuschwanstein, then the Disney animated castle below. There is quite a resemblance! 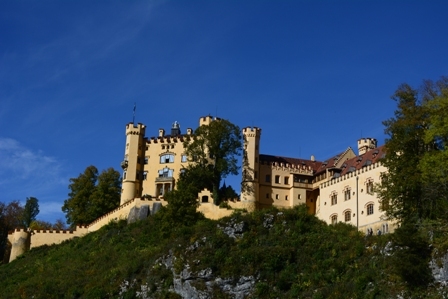 However, Neuschwanstein does often overshadow another nearby castle – Hohenschwangau (pictured below). This castle was actually the family home of King Ludwig when he was a child and thus inspired him to build his own castle years later. Something the tour guide said really got me thinking though. She said that these paintings are done in the style of German Romanticism. This is a cultural movement that was big when Jacob and Wilhelm Grimm were publishing their tales. 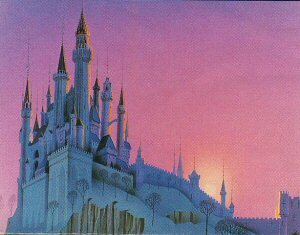 It never really hit me before that what we consider a fairy-tale style is actually a Romantic style. The immense popularity of the Grimms’ tales has made us associate fairy tales with the visual art of their time. Today, not many of us are familiar with earlier Italian and French fairy tales (many of which inspired the tales in the Grimms’ collection). Yet, if sixteenth-century Italian tales had always reigned supreme in popularity, would we associate fairy tales with sixteenth-century Italian artistic style? Just a little musing from me!